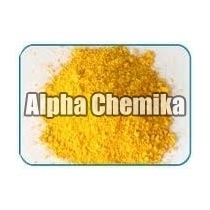 We are instrumental in offering the best quality Yellow Mercuric Oxide. Available in the powder form, Yellow Mercuric Oxide is hygienically packed in optimum grade packaging material to ensure maximum protection from foreign chemicals. Yellow Mercuric Oxide serves as an active antiseptic agent, ophthalmic agent, antiparasitic agent and anti-infective agent. It is broadly used in the synthesis of a mercury based superconductor. Also, Yellow Mercuric Oxide is used as a chemical intermediate for mercury salts, organic mercury compounds, and chlorine monoxide. The Yellow Mercuric Oxide is stable under normal conditions of use and storage. Further, it decomposes when exposed to light.